Length: 733mm. Image shows assembled and painted kit. 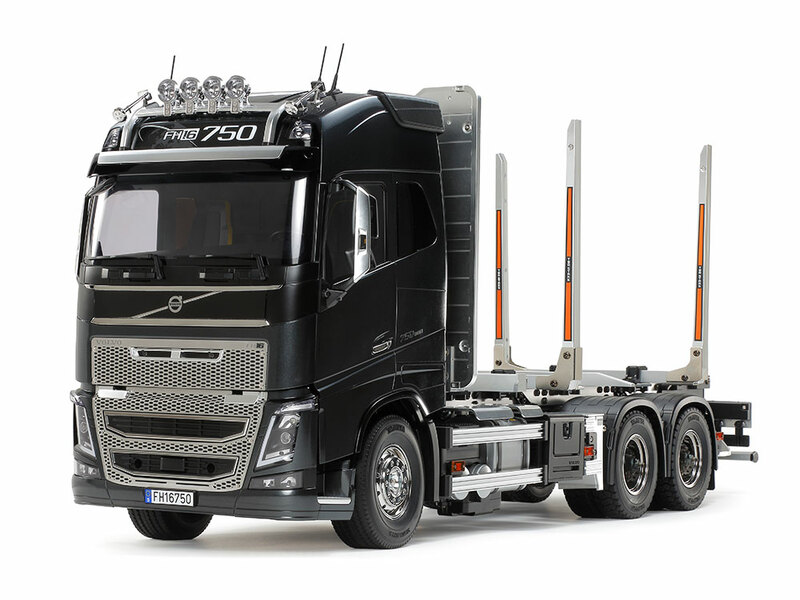 Volvo is a renowned actor in the global commercial vehicle market, with one of their flagship brands being the FH Series that underwent a full model change in 2012. This R/C model assembly kit recreates the 750hp 16.1-liter turbocharged inline-6 engine FH16 Globetrotter 750 6x4 timber truck from that range. 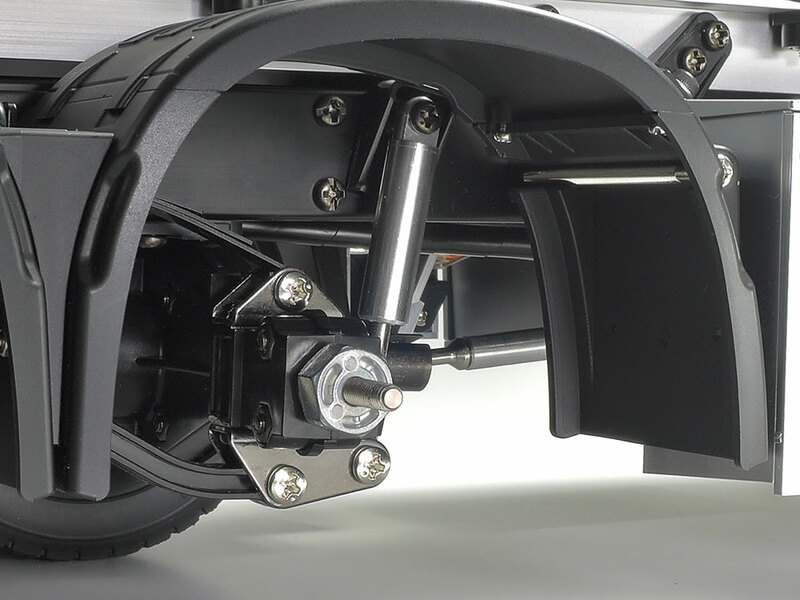 The model has a realistic body, and a chassis featuring numerous metal parts. Gear changes are also possible via transmitter controls. ★Ladder frame features aluminum side channels with resin cross members. ★Depictions of stakes and cab rear headboard use a durable combination of resin and metal. 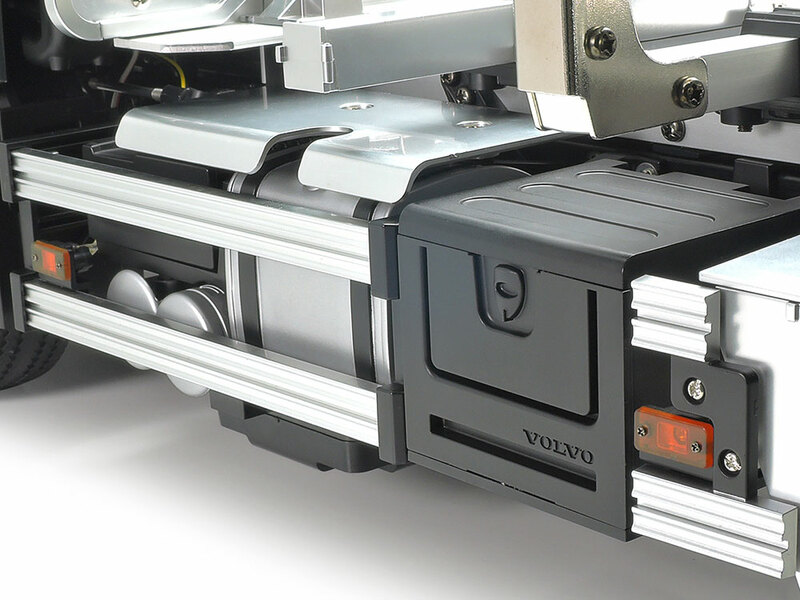 ★Power from the front-mounted motor is delivered to rear axles via propeller shaft. 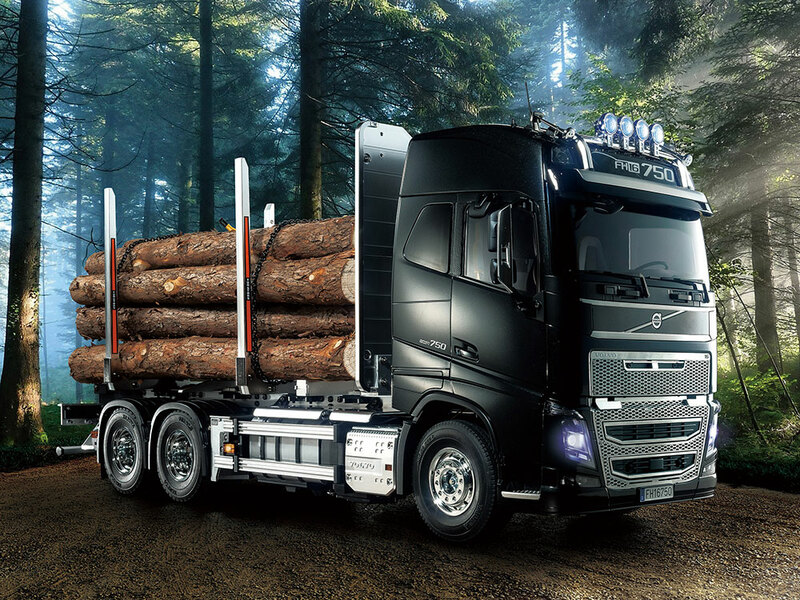 A built-in differential gear on each axle enables smooth cornering. 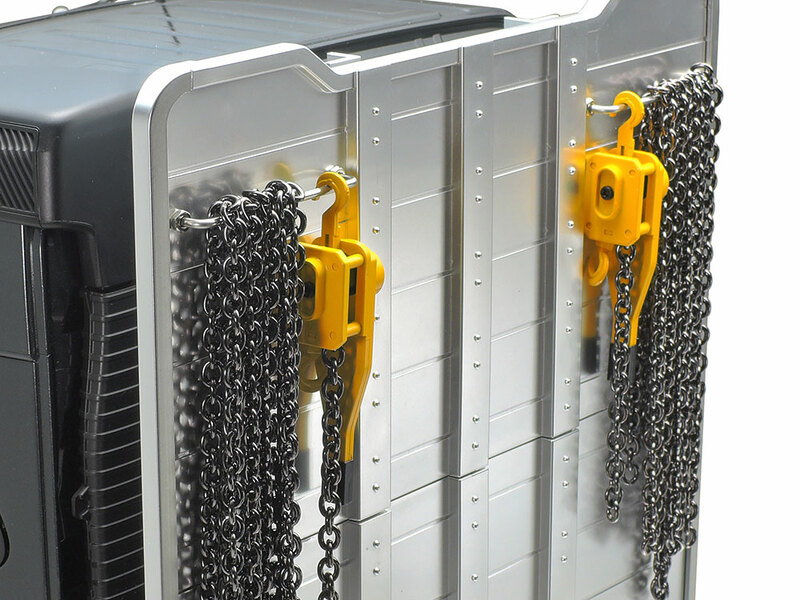 ★Highly-realistic suspension utilizes metal leaf springs and friction dampers. 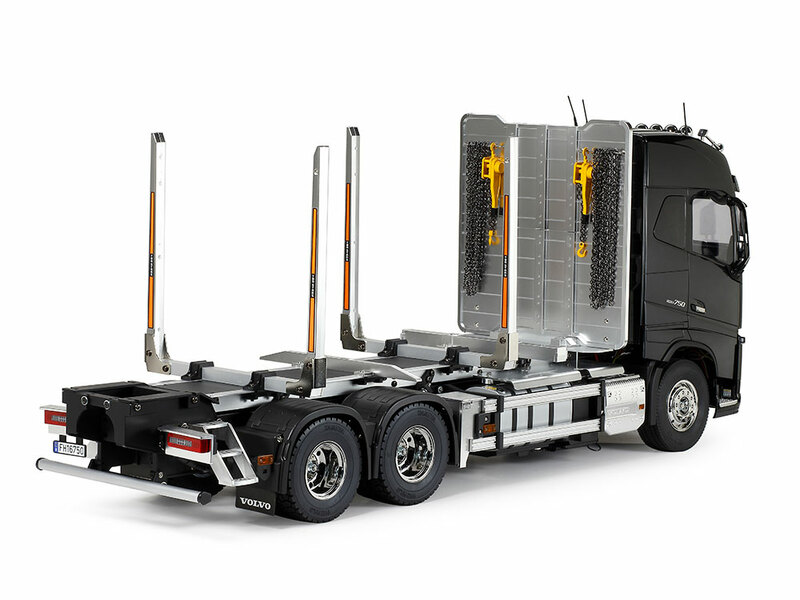 The model enjoys easy driving thanks to the float-mounted die-cast front and reinforced resin rear axles. 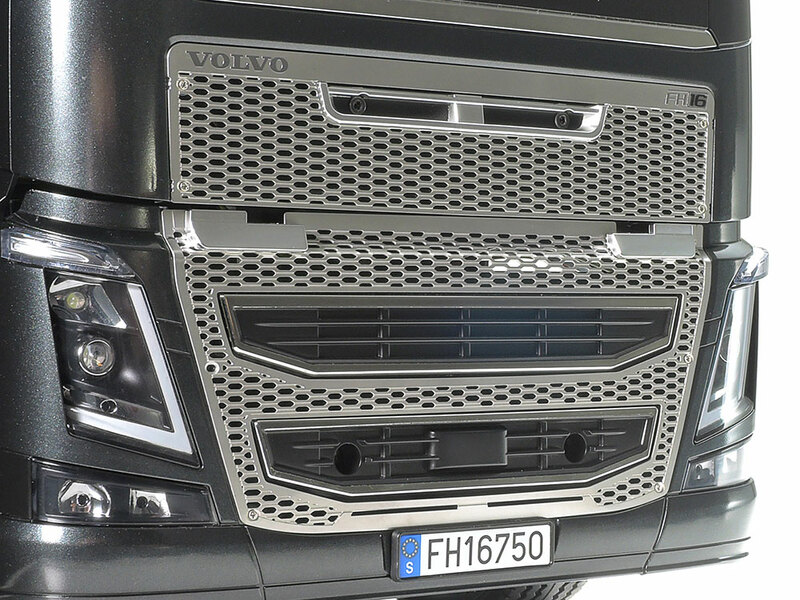 ★The highly accurate body captures the FH16 Globetrotter form, with stainless steel photo-etched front grille, and cab interior details. ★TR Mighty Tuned motor (35T) provides plenty of power, even when driving with loads. ★This view shows off the brand new timber bed design, complete with stakes to keep the lumber load intact. 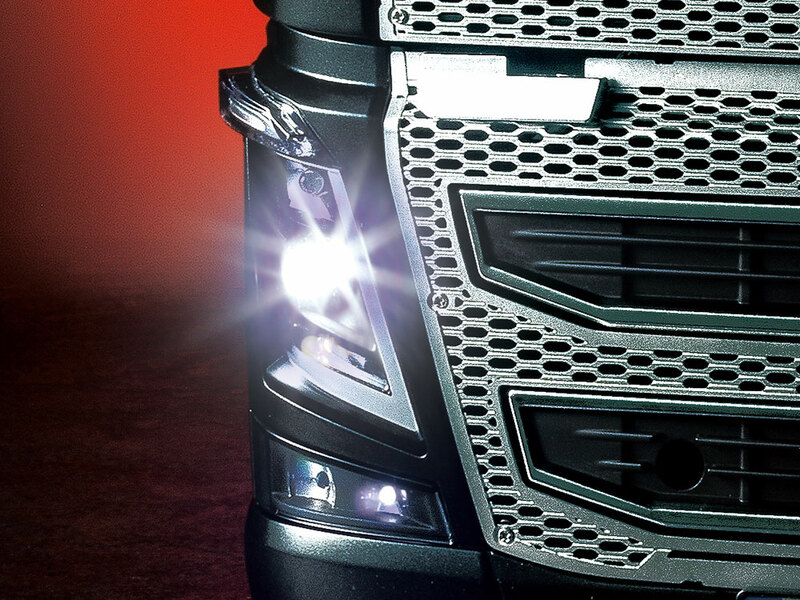 ★Optional on the actual truck, the roof lamps give a realistic look, with horn, antennae and more. 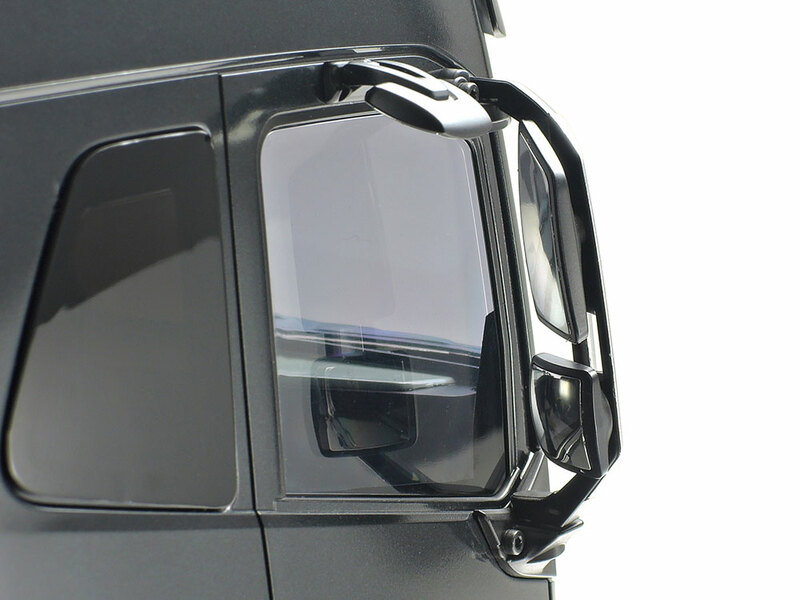 ★The distinctive side mirrors are recreated faithfully, by metal-plated parts for an authentic finish. ★Here is a close-up of the photo-etched parts, which adorn the finely molded depiction of the cab. 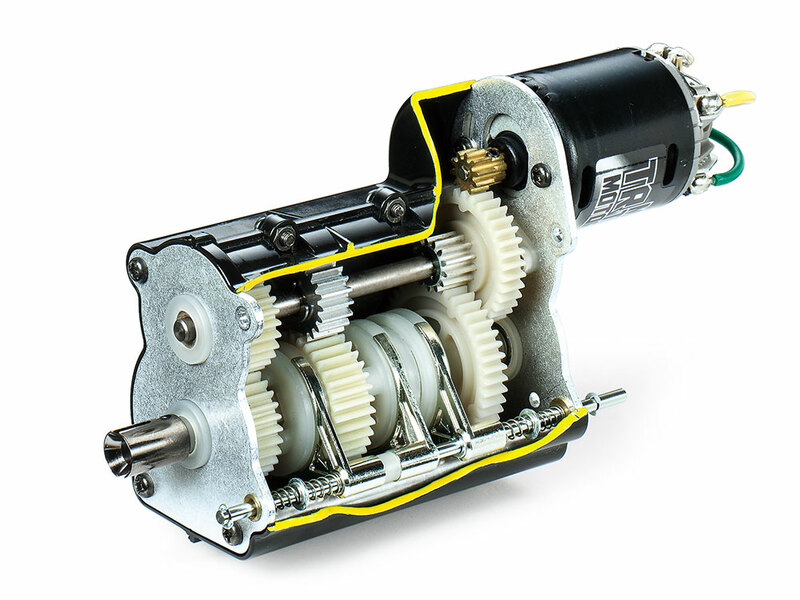 ★3-speed transmission allows gear changes on the move when used with a separately-sold 4ch transmitter. 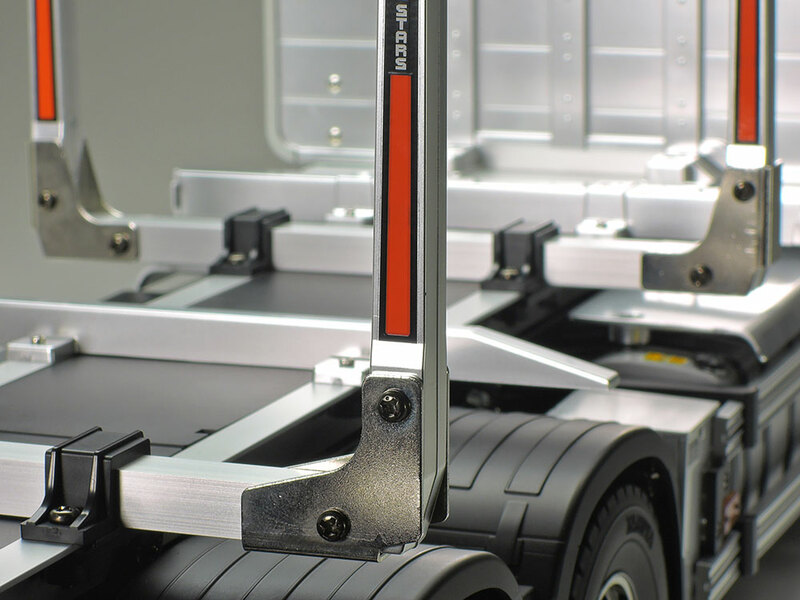 ★Rear trunnion type suspension mimics that of full size trucks. The friction damper has a metal cylinder. 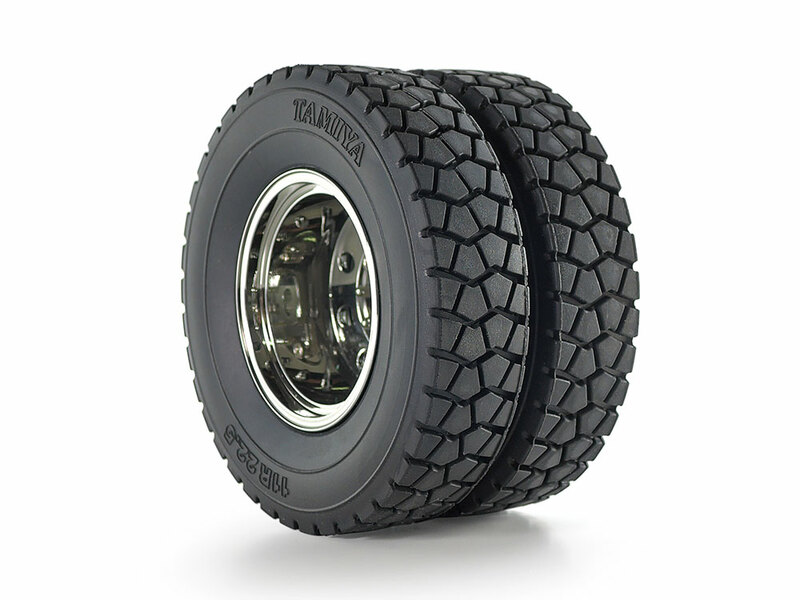 ★A close-up of the dual rear tires, which are given realistic tread pattern for plenty of grip. ★There is plenty of detail, highlighted here by side guards, tank shield and sanding gear depictions. ★Metal-plated resin headboard and resin stake components secure durability and superb realism. 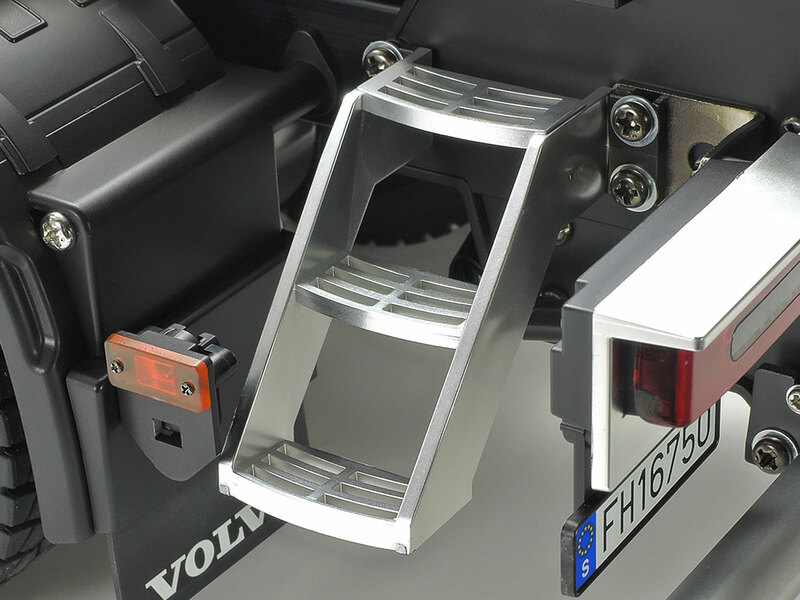 ★We haven't forgotten the details - the rear steps are recreated by resin parts with a plated finish. 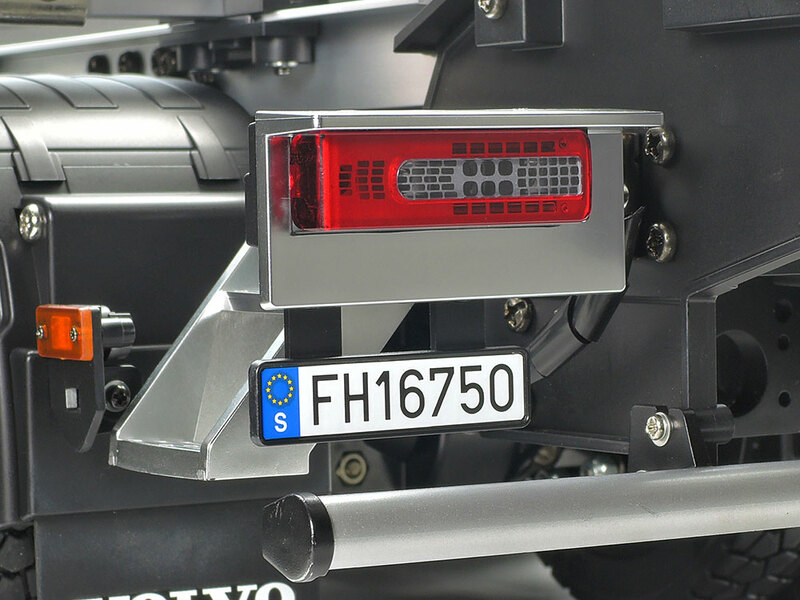 ★Why not use the separately sold MFC-03 unit to light up components such as the square taillights? ★Chains and lever block parts are also included in this comprehensive kit, for display purposes. 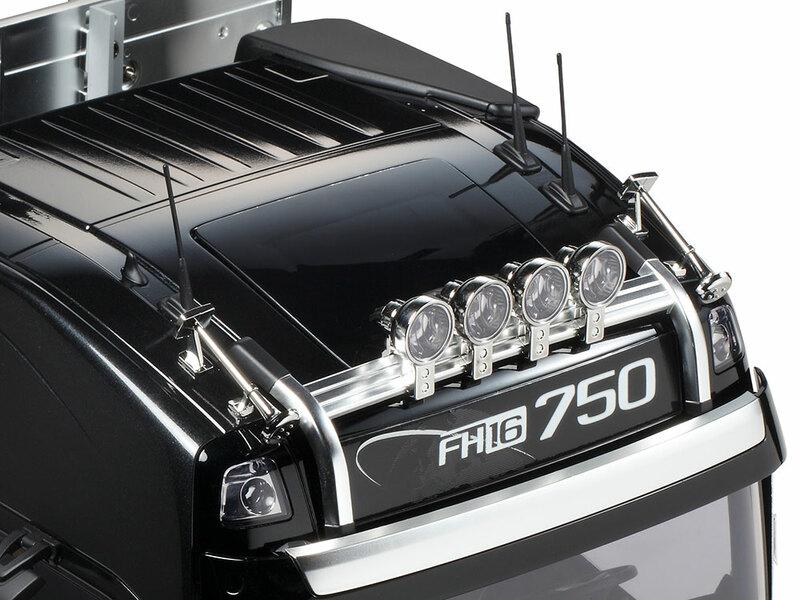 ★Fitting the separately sold MFC-03 unit will also allow lighting up of headlights, fog lamps and more. ★Why not load up your timber truck with some realistic papercraft lumber - templates below! Tamiya Multi-Function Control Units (sold separately) offer light, sound, and vibration operation to accompany your R/C truck experience. Engine sounds have been digitally recorded from actual trucks, and together with air horn, gear shifting, and many other realistic sounds, give you the feeling that you are driving the real thing! Headlights, brake lights, fog lamp, hazard lights and turn signal operations are also at your fingertips. Information is correct as of April 16, 2019. Specifications are subject to change without notice.